In 140 years of record-keeping, four of the five latest first 1″ snows have come in the last 12 years. One Boston TV station asked its meteorologists to guess the date of our first snow and all were wrong, guessing way too early. Are they paying attention to our climate trends? One look at our snow records – both low and high – shows how Boston winters are trending towards extremes. 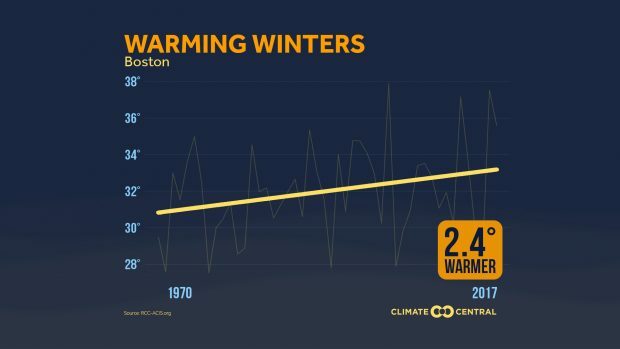 Boston winters have warmed 2.4 degrees F in just the last 50 years, according to Climate Central. Warming affects snow in weird ways. It turns some snowstorms into rain. But warmer ocean water adds fuel to blizzards and nor’easters, and warmer air can hold more moisture. “As long as it stays below freezing, the snow dumps are bigger, but the snow season shrinks at both ends of winter,” as IFLscience puts it. So far, January is 3.8 degrees F above the historic average in Boston and December was 2.6 degrees above normal. As this weekend’s nor’easter approaches, it will find extremely warm water waiting off New England’s coast, a puddle of fuel waiting for a storm’s match. Massachusetts centrists’ response to this is to say … but can’t we just build a little more climate-disrupting fossil fuel infrastructure? A few more fracked gas pipelines and compressor stations? At a time when climate scientists say we need to be cutting carbon pollution as rapidly as possible to avert catastrophe, aruging for new fossil fuel infrastructure is like guests in the ballroom of the Titanic trying to negotiate with the rising water for just a little more time to listen to the music. Snowing affects warming in weird ways, also… a layer of snow on the ground will reflect sunlight back differently from grass and soil (and other things) . Longer periods with more snow cover and more cooling will occur. Conversely, less cooling (more heating) happens with less snow cover. The first graph displayed shows not only the normalized line of increasing temps but a greater variation between low temps and high and some portion of those highs might be a function of less snow cover.